Since I acquired the Mercury catalogue pamphlet I introduced at this site a while ago, I bought several other Mercury pamphlets. 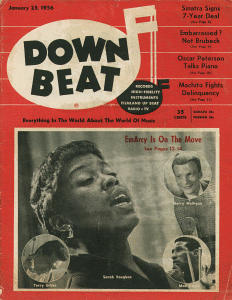 And this time, I have bought one of the most famous Jazz magazines Down Beat magazine of Jan. 25, 1956 issue. The reason why I wished to obtain this issue was, that the Jan. 25 1956 issue had a special feature articles dedicated to the EmArcy label. An excllent article by Nat Hentoff, as well as EmArcy's producer Bob Shad's own writes are on the special issue. We can read and feel the atmosphere of that time when EmArcy was going to emerge and expand. Furthermore, some historically important facts can be found on these articles (such that EmArcy's very first release was made in Oct. 1954). Of course there are so many other interesting articles and ads on this issue. This page contains a single entry by Shaolin published on March 16, 2004 8:40 PM. 川崎 TOPS was the previous entry in this blog. eBay SCREWS UP Record category! is the next entry in this blog.